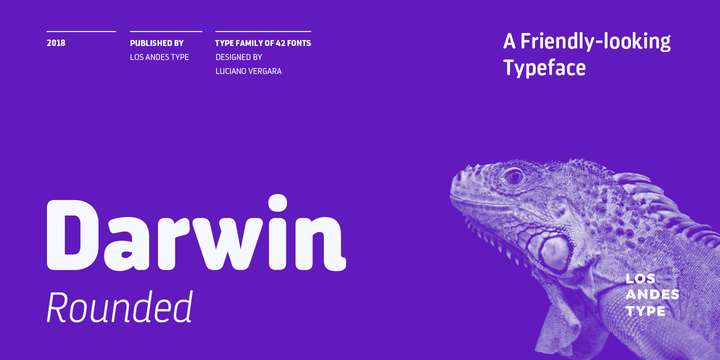 Darwin Rounded is a sans serif typeface created by Luciano Vergara and published by Los Andes which is available in 3 widths (Pro, Essential, Essential Alt) each with 7 weights (from Thin to Black) and italics. It is a geometric typeface with condensed proportion, that features abrupt transition from curve to straight line and it is slightly inspired by calligraphic and humanist typefaces. Enjoy! Styles: Pro, Essential, Essential Alt, Thin, XLight, Light, Regular, SemiBold, Bold, Black, Italics. A font description published on Tuesday, May 8th, 2018 in Fonts, Los Andes, Luciano Vergara by Alexandra that has 1,240 views.